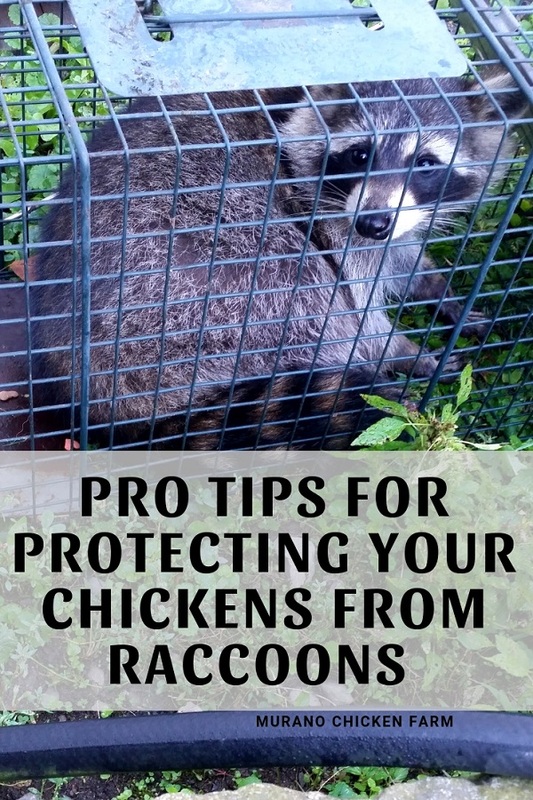 Raccoons are a problem for almost all chicken keepers. While only those of us in rural settings have to deal with things like bears or bobcats trying to eat our chickens, raccoons are literally everywhere. Also, they are quite smart. Raccoons can remember the solution to a problem for at least 3 years. That means that if a raccoon figures out how to open your chicken coop, he's not going to forget any time soon! 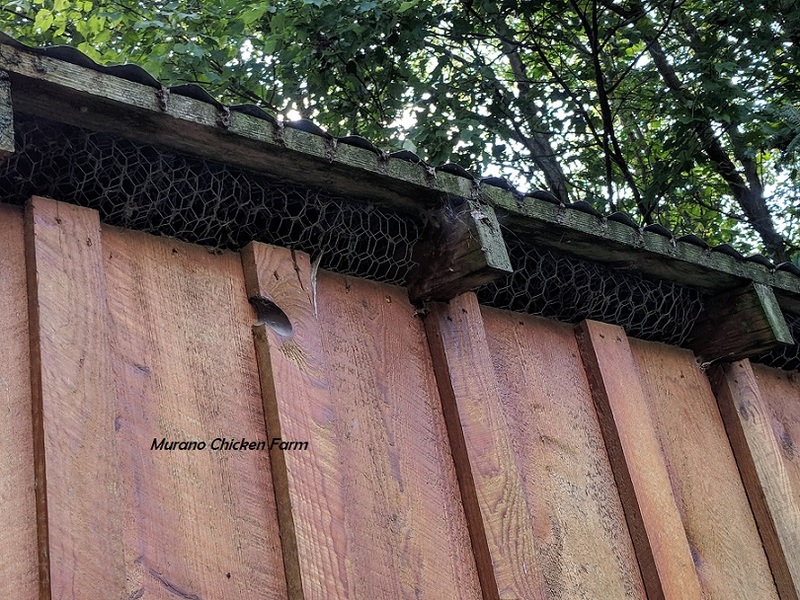 While predator proofing your coop and run is always important, predator proofing for raccoons is a little more difficult. They're smart, can dig well, can climb almost anything and are very skilled with their front paws. Plus raccoons in high density areas tend to socialize in groups, often meeting at feeding grounds. So if one raccoon finds your chickens, more are often close behind. 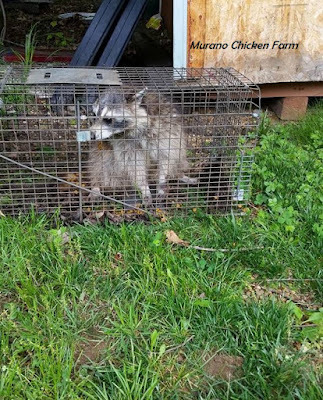 The best course of action is to avoid attracting raccoons to your chicken coop to begin with. 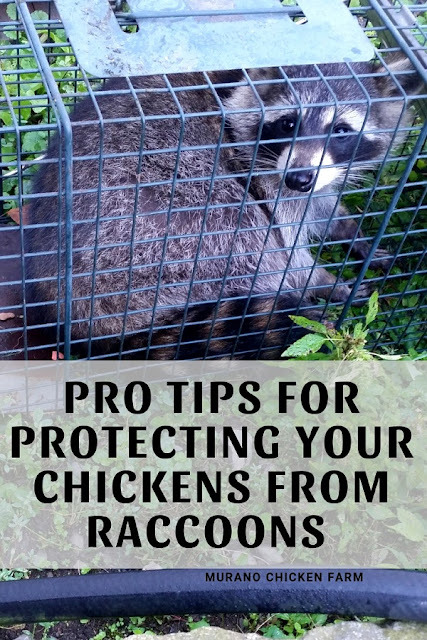 A predator proof coop and chickens that are securely closed in at night when raccoons are most active are your best lines of defense against these midnight bandits. Raccoons are nocturnal and opportunistic and will be attracted to food and water left out overnight. Dump out water bowls that are left outside each night and put away any uneaten chicken feed. Do not leave feed in the run overnight as the raccoon might try to break in to get it. Remove eggs from the run and surrounding areas. You don't want to give the raccoons a reason to keep coming back. Make sure the chickens are closed in at dusk when raccoons become active. Automatic coop doors are perfect for closing the chickens in when you won't be home around that time. Locks. As mentioned above, raccoons can figure out how to open all kinds of door latches and remember the solution for several years. In one study done on raccoons they successfully opened a box with food in it using the following latch systems: a button, a vertical gate hook, a bolt, a T-latch, a lift latch, a plug, a horizontal hook, a bear-down lever and a push bar. You can check out the results starting on page 464 of the document. Raccoons can also grasp the concept of multiple latches, so more is not necessarily better. 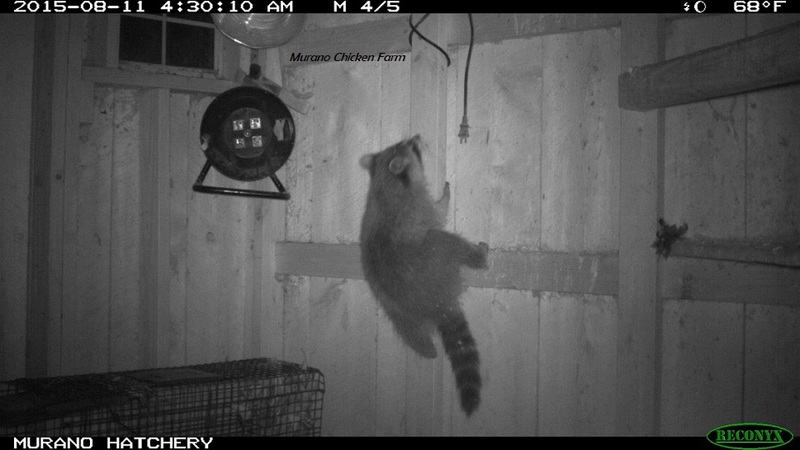 The only way you are keeping a determined raccoon from unlatching a chicken coop door is with something complex. We use a different type of latch on each coop with a carabiner through it instead of a lock. The screw ones work best. Raccoons can use their fingers quite well but they do not have opposable thumbs. Their thumbs can only move about halfway across the palm, so before trusting a lock system attempt to open it without using your thumbs completely. If you can do it, it's not difficult enough. Raccoons can climb wood quite easily. If your chicken coop is made of wood a raccoon will have no problem climbing straight up the walls on the outside and back down the walls inside the coop. The first time a raccoon entered my coop at night and killed a chicken, I was shocked to find a half eaten chicken on the coop floor in the morning when I opened the doors. I was sure that I had somehow missed the carnage the night before when I locked the chickens up at night, but I set up a trail cam and trap anyway. This is the picture I found the next day. Raccoons can squeeze into spaces that appear much smaller than they are. If a raccoon's head can fit through, they will squeeze their body through. They're surprisingly squishy. Check areas above and below doors, and near the coop roof to make sure the gap is not large enough for a raccoon to fit through. Raccoons can dig quite well. This is a big problem if your coop has a dirt floor. Many chicken keepers bury an apron of welded wire around the perimeter of their coop and run. It does work, though I tend to rely on a guard dog instead. 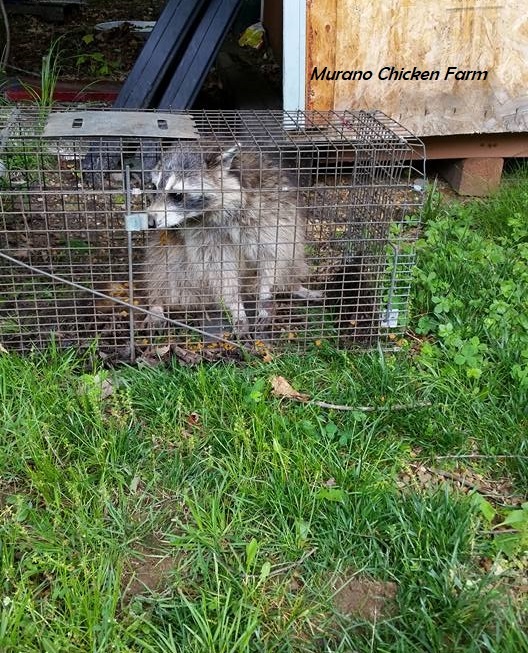 If you have had problems with raccoons around your flock you should probably keep a safe trap on hand. I've had great success trapping raccoons with marshmallows and peanut butter. I throw the marshmallows into the back of the trap and smear the peanut butter all over the trip plate. I even smear some on the underside of the trip plate. Once the raccoon starts licking the peanut butter off he will grab it with his paws to try to get under it and will trigger the door. This works on even the most unreliable traps! I have not had very good luck with cat food or tuna as some recommend. I always catch cats! lol Unless you are trapping somewhere the cats can't get to it, I recommend peanut butter and marshmallows. Relocation: I am not a huge fan of relocation. I believe that when you relocate a predator, you simply give someone else your problem. It would really upset me if someone decided that my road was a good release area and since I live near the woods, it very well could happen. Personal thoughts aside, I need to mention that relocation is not always a legal option. If you choose to catch and release you could be subjected to fines or other penalties based on your local ordinances. Check your local laws before releasing an animal somewhere else. What you choose to do with a predator is a personal decision but I would hate for someone to be fined or worse for protecting their flock. Now that your coop is predator proof, don't forget to give it a quick inspection every so often to make sure nothing has broken or come loose. Predators are opportunistic and will strike when you least expect it, so keep an eye out for any potential problems. Having problems with other predators around your coop? Click here for my previous posts on chicken predators! Had to deal with raccoons and possums in my neighborhood. Do you have any material or recommendations for possums Lisa? I use safe traps to catch opossums. I've had problems with them eating eggs and killing chicks so I take a proactive approach and always keep traps baited and out by the coop. The same predator proofing for raccoons will work for opossums too, but opossums will often come out during the day too. If you're coop is left open, make sure hens aren't setting on eggs on the floor of the coop and nest boxes are high enough so opossums can't get into them. Good luck!